Have fun, and happy Memorial Day Weekend! It’s been quite a while since I last posted, and for good reason- I’ve been busy. 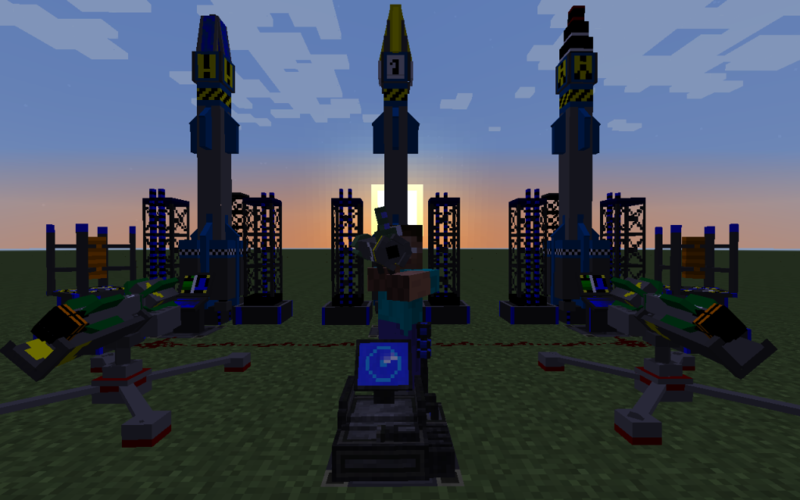 Back in the late-beta/early release days of Minecraft, a new mod emerged – ICBM – that brought fancy-looking missiles and cool explosive things to the game. It quickly became one of my favorite mods after messing around with it, and I ended up getting close with the mod’s developer, Calclavia. ICBM was maintained for a good long while, and eventually spawned the “Universal Electricity” framework that Mekanism integrated with. However, Calclavia ended up failing to find the time to maintain ICBM after 1.6.4; something I found disappointing after the great fun I had playing with it. This isn’t to say that a mod like ICBM was completely abandoned, however. Darkguardsman began maintaining his own version of ICBM that is up-to-date with 1.7.10. This version, however, is a complete remake of the original ICBM; something some may appreciate, but I found myself missing the classic mechanics and style of Calclavia’s version. There’s sadly not a single classic port of ICBM available for Minecraft 1.7.10. I decided to port the last stable release of Calclavia’s ICBM to 1.7.10. Calling it a ‘port’ is not necessarily accurate; I’ve completely overhauled the engine to use Mekanism’s core source libraries and removed some of the content I found unfitting with the mod’s original theme (if you miss the sentries, check out OpenModularTurrets- I prefer them personally). As of right now, all the assets are the same, but I’m in contact with CyanideX who has plans to work with me in retexturing the entire mod to follow a more consistent, modern theme. Missiles. Advanced missiles that can be launched from tiered platforms with varying target accuracy. Explosives. Countless different explosives with unique, devastating explosions. Radar Systems. Track friendly and enemy missiles, and fire off anti-ballistic missiles when necessary. Rocket Launchers. Launch certain missiles directly from a handheld device. EMP Towers. Disable missiles before they reach your base, and take enemies’ power systems offline from a distance. I’ve also implemented some general improvements that should make DefenseTech more streamlined and stable than any past ICBM release; most all machines now have OpenComputers and ComputerCraft integration, all machines work with RF, EU and Mekanism power, and extraneous libraries have been eliminated to leave Mekanism as the only dependency. I’m really excited about this, and I have some ambitious plans for new content in the future. For now, though, DefenseTech serves to continue the experience from ICBM that you loved. Downloads can be found on DefenseTech’s shiny new download page. Enjoy!